The hodgepodge of different LTE frequency bands used by various carriers globally has necessitated three versions of iPhone 5, with the potential for additional new models as Apple signs on other carriers. Apple built a single, global model of the iPhone up until the beginning of 2011, when it introduced a CDMA-only iPhone 4 version compatible with Verizon. When it introduced iPhone 4S a year ago, Apple incorporated support for both GSM and CDMA networks, resulting in a "world phone," albeit still locked by specific carriers. The new iPhone 5 now comes in three LTE versions, all of which continue to support the global GSM/UMTS services of iPhone 4S (Quad Band 2G GSM/EDGE on 850, 900, 1800, 1900 MHz, and Quad Band 3G UMTS/HSDPA/HSUPA on 850, 900, 1900, 2100 MHz) with new support for "4G" DC-HSDPA (which at up to 42Mbps is as fast as most carriers' 4G LTE service). Only one of the three versions continues to support CDMA. A North American GSM A1428 model for use on AT&T and Apple's Canadian partners Bell/Virgin, Rogers/Fido and Telus/Koodo provides LTE support for bands 4 (AWS) and 17 (700b MHz) but not CDMA. AWS-flavored LTE is exclusive to North America, where it was originally assigned for use as wireless cable. In both the US and Canada, it has been reassigned for mobile voice and data networks. While Canadian carriers used it for LTE deployments, T-Mobile acquired large portions of the U.S. rights to AWS and used it to build out its non-standard 3G UMTS service. This is one significantly reason why AT&T wanted to acquire T-Mobile two years ago. After the U.S. government intervened, T-Mobile was left with its AWS 3G service incompatible with previous iPhones. It now plans to build out LTE service, although that won't happen until next year, leaving it with the interim option of shifting its 2G GSM service to 3G/4G HSDPA in order to woo unlocked iPhone 4/4S/5 users (which it currently has in place in only a few markets). A second, CDMA model A1429 will support Sprint and Verizon's CDMA network in the U.S. and KDDI in Japan. In addition to the standard "EVDO rev A" 800 and 1900MHz support on previous CDMA iPhones, iPhone 5 now also supports the slightly faster and more efficient rev B on 2100MHz. Sprint and Verizon once considered upgrading to EVDO rev B before throwing their support behind 4G networks, but Japan's KDDI does use rev B networks. CDMA carriers in India and Russia also support rev B. More importantly, the CDMA iPhone 5 supports LTE Bands 1 (2100MHz), 3 (1800MHz), 5 (850MHz), 13 (700cMHz, used by Verizon) and 25 (1900MHz, used by Sprint). The first three bands overlap those used by Apple's other carrier partners in Europe and Asia (but not AT&T/Canada), although the company also notes that "band support does not guarantee support on all LTE networks running on the same bands." A third model for the rest of the world supports GSM carriers that have added support for LTE on Bands 1 (2100MHz), 3 (1800MHz), 5 (850MHz). 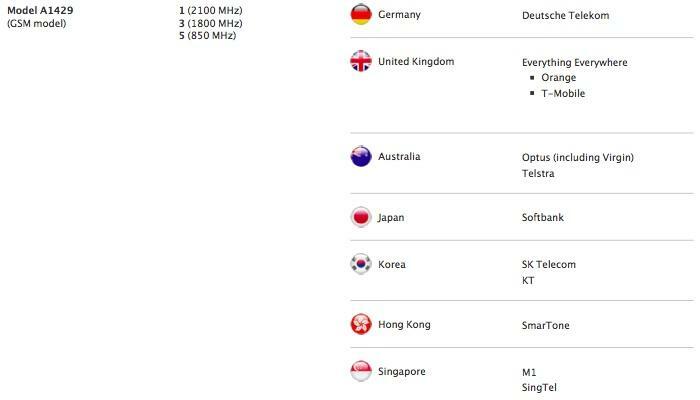 This includes Deutsche Telekom in Germany, Everything Everywhere in the UK, Optus/Virgin and Telstra in Australia, Softbank in Japan, SK Telecom and KT in Korea, SmarTone in Hong Kong, and M1 and SingTel in Singapore. There are several other global LTE carriers Apple could support, either with its existing models or new models, that the company hasn't announced any deals with yet. In Japan NTT DOCOMO uses Band 1, and a long list of other European carriers are deploying Band 3 LTE. T-Mobile, Cricket and MetroPCS use Band 4 (AWS) in the U.S., so these carriers could all apparently be supported by Apple's existing models, given a carrier agreement. Other carriers have deployed LTE Bands that none of Apple's existing iPhone 5 versions support. A variety of carriers in Austria, Brazil, Denmark, Estonia, Finland, Norway, Russia, Sweden and Switzerland are all deploying Band 7 (2600 MHz), while others in Germany and Sweden are using Band 20 (800MHz), and a variety of Middle Eastern carriers have started building out Band 38 (2600MHz). iPhone 5 is believed to use Qualcomm's fifth generation MDM9615 baseband chip, which supports both FDD and TDD signaling technologies for LTE. FDD or Frequency-Division Duplex signaling technology is used by CDMA and WCDMA/UMTS for most modern cellular systems, and is the technology most LTE providers will use, including the networks being built out by AT&T and Verizon in the U.S. Qualcomm owns most of the patents supporting CDMA and WCDMA technologies. TDD or Time-Division Duplex is an alternative flavor of the LTE standard developed by China, and is being deployed in that country under the name TD-LTE. China developed its own TD-SCDMA and now TD-LTE to avoid paying Qualcomm's patent royalties. By supporting both FDD and TDD technologies, Qualcomm's chipset can enable a single device to work on a wide variety of 3G or 4G networks. It's not clear if Apple is supporting TDD-LTE (or China's 3G TD-SCDMA) in its existing iPhone 5 versions. This would dictate whether a separate model would be needed to support LTE service in China and India. Apple's partner Softbank initially built out TDD-LTE in Japan, but has since augmented its coverage with standard FDD-LTE. However the MDM9615 does appear to be giving Apple support for new DC-HSPA+ and EV-DO Rev-B, making it likely that Apple's existing iPhone 5 models will eventually make it to a wider selection of carriers. And even in areas with incompatible LTE networks, iPhone 5 will support very fast HSPA+ networks at similar speeds to today's LTE deployments.